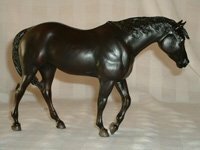 One of the most impressive Indian Ponies to date that Breyer has produced is the SR of 2007 for the Just About Horses magazine. (JAH for short). Her name is Cassiopiea and she is a dapple gray with the dapples being in the shaped of stars. The JAH models are limited to 350 made and are only available by lottery system to the subscribers of the Just About Horses magazine. If you are lucky enough to have your name drawn, you are notified by a letter from Reeves International for the purchase amount. And when you receive your letter, you better hurry and send a check, because there are many others waiting in line to have a chance to receive that model as well. The rewards are very much worth anything you pay to own one of these very limited edition models. If it happens to be a Breyer mold you do not collect, you simply have to list it on eBay and more than get your money back. They almost always turn out to be a great investment. The picture to the right is of Belle, from the Saddle Club Series made in 2008. She reminds so much of the mare I grew up with; very steady in nature, always listening and attentive to her rider. We enjoyed many trail rides together and even won a few barrel races. 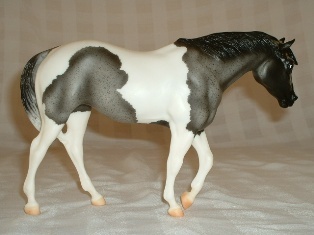 I was hoping that Breyer would create this model in black, but if the truth be told, when I was taking pictures of Belle, she looked as if she was a washed out or faded black with just a hint of bay showing through. Just like my Gypsy did. For the Collector who loves the Indian Ponies, the Blue Roan color, or Paints and Pinto’s, the 2009 new release Indian Pony Shasta Moon has all of them covered. She is one of the early releases for 2009 and of course is stunning with her shading and character that is typical of the Indian Pony. And although there may be many of her made, she is still a wonderful model to help build your Conga Line or to set up in a show. The richness of her coloring and the true to life shading are wonderful. She is sure to add interest where ever she goes.